SAGITA COM - Dengan Macrium Reflect Free Edition Anda akan dapat dengan mudah membuat image yang akurat dan dapat diandalkan dari HDD atau partisi individu. Menggunakan image ini Anda dapat mengembalikan file seluruh disk, partisi atau individu dan folder dalam hal kehilangan sistem sebagian atau seluruhnya. * Incremental and Differential backups. * Include and exclude filter ensures that you only backup relevant files. * Browse the backup file as a virtual FAT32 hard drive in Windows Explorer. * Files in use by Windows (such as Outlook .pst files) are backed up even when locked! * Optionally exclude system and hidden files. * Supports Incremental and Differential backups. * Password protect backups to prevent unauthorized access. * Restore specific files or the entire backup. * Restore to any location. * Resize the restored partition. 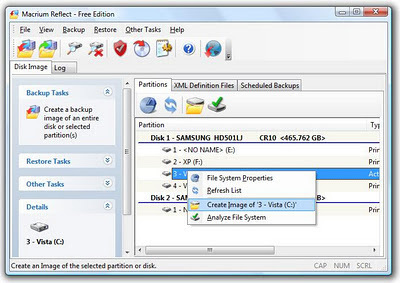 A hard disk upgrade can easily be performed by increasing the partition to fill the new disk. * Track 0 (The Master Boot Record) is saved with all backups. * Backup files can be saved to local or network drives or optical storage (CD, DVD). * Disk image can be created whilst Windows is in use. A special driver ensures that the disk image represents an exact point in time and will not be affected by disk access that may occur during the backup process. * Verify images. Images (Backup files) can be separately verified or automatically verified before restore. * System files such as 'pagefile.sys' and 'hiberfil.sys' are not included in the image. This reduces the final backup file size. * Three compression levels can be selected to optimize between file size and speed. * Password protect images to prevent unauthorized access. * AES 256 bit encryption for ultimate security. * Set image filenames automatically. * Windows PE 2.1 rescue CD with Windows boot menu. * Save your backup definitions as XML files and execute them with a single click from your desktop. * Includes VBScript integration and a VBScript generator for unparalleled control of the backup process. * Schedule daily, weekly or monthly. * Automatic incremental / differential images. * Automatic disk space management for local / remote hard drives. * Full logging of all backup operations. HTML log reports are generated and can be viewed using Reflect's built in browser.